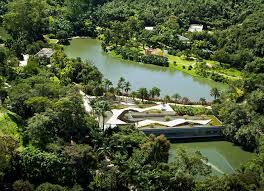 “Nothing can prepare you for the breathtaking beauty of Inhotim, Brazil’s best-kept secret for lovers of contemporary art”. That’s how Zach Udko starts his blog at The Huffington Post. He is right, of course. 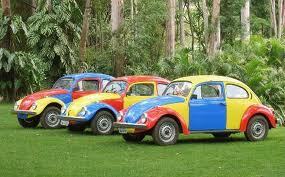 But Inhotim (pronounced IN-YO-TCHEEN ) is a lot more than that. There are musical events, school visits and several community projects ranging from Art as a way of reading contemporary life to biodiversity conservation activities which aims at a model of sustainable living. It serves more than 70,000 people in the school community annually. There are 5000 acres of botanical gardens which houses 500 works by 100 artists from 30 countries in over two dozen gallery pavilions. Among them you’ll find Matthew Barney, Chris Burden, Janet Cardiff and George Miller, Anish Kapoor, and Brazilian Tunga. 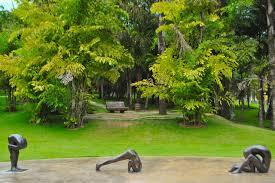 Designed by Burle Marx, Inhotim finds alternative ways to minimize the environmental impact that its own projects cause. It disposes of all its solid residues according to International environmental rules; it has preserved all the hydric reservoirs and utilises it for irrigation; it has partnerships with universities and international research centres for its fauna and even has its own carbon credit scheme sold to individuals. The gardens are a field for floral studies, the cataloging of new botanical species, onsite and off-site conservation, and environmental education actions. It complies studies of the botanical species of its collection of approximately 5,000 species, representing more than 28% of the known botanical families on the planet. Inhotim School’s program happens beyond the Institute’s facilities and includes art exhibitions, screening of videos and films, lectures and courses, workshops and meetings with artists, among other activities. During the World Cup there will be held Encontros series with artist Apichatpong Weerasethakul, an internationally recognized independent cinema producer and director. winner of Golden Palm of the Cannes Festival in 2010 for his film Uncle Boonmee Who Can Recall His Past Lives (2010).